Ho, Ho, Ho! LEGO Christmas Sets...Are they Naughty or Nice? LEGO Seasonal sets have proven over the years to be solid performers in the LEGO secondary market. From the "Winter Village" series to the Holiday polybags to the small promotional sets that LEGO gives away with purchases, Christmas themed sets perform very well. Let's take a closer look at a few of the Christmas themed LEGO sets. On a personal note...My favorite time of the year is almost here...and I'm 200% ready for it! I forgot to hoard Christmas LEGO sets!!! In green you see what retirement does to these sets: Prices go UP FAST. Obviously any price indication is only meaningful if there are enough quantities (6 months accumulated) sold. This is definitely the case: the 6 month volume has exceeded the hundred mark handsomely as is highlighted in the orange box (column 3). If this continues at the same pace, in half a year's time, there won't be a lot of inventory left of the Winter Toy Shop, nor the Winter Post Office. People are ready to pay the full price. If you look at the numbers highlighted by the red box, you'll see that on Ebay, some auctions went more than triple the MSRP price. Again, these maximum selling prices are confirmed on Bricklink too. It seems for example that somebody in September (2014) wanted to complete his collection and bought the Winter Village Toy Shop at 199.9 Euros, more than three times MSRP. You might wonder how to interpret the column named 'Sticky price'. This is a price level at which there are still a lot of offer. If you would be looking to load off some Winter sets quickly, setting your price 5% lower would be the smart way to get a quick sale. Now, why are the Winter series so popular? 1. They are beautiful, very colorful and clearly follow a story line of Christmas: a Toy Shop to get presents, a Post Office to send all the postcards and packs, a Bakery to get your bagels and croissants, a nice Winter Cottage in the woods covered by a thick layer of snow and a cosy hearth, a Village Market with a carousel for the children, and finally Santa himself who will visit that splendid town throwing the presents in all the chimneys. Every parent can create a great scene under the family Christmas Tree. This as a matter of fact, has become our family ritual every year. In December we build the latest Christmas LEGO set and its extras (2 minis). Without going into a full set review, I can tell you the sled and reindeer are just magnificent. I'm not sure how we can integrate the factory in the Village setup yet. Probably, we'll have to get Santa's home up a mountain a little out of the town. We'll see. 2. It's all fitting together - a collection! White roofs, a light brick in each large building, decorated street lights, large chimneys, lots of singing, presents, minifigures in the snow... LEGO brings Christmas into your home. Take a look at the picture below. I've just 'dumped' all my Winter buildings together and it already looks fantastic. Image what effect you get when you put some effort in it? (Which will happen in December - the article came a little too soon) You'll see: once you have one set, you get pulled into wanting all the others too. And this makes this series so powerful as an investment. The more releases, the better it becomes. I've already mentioned it, but it's important: The Winter Village sets are built for young and old. They each have a story embedded on the box. Who makes the toys? When will the Christmas cards arrive? Can we get a mug of hot chocolate and a croissant? Is dad still outside cutting logs, and grandpa reading his newspaper next to a great fireplace? Can we go to the fairground? Were does Santa Live? Find the light brick! All those presents! Evey year we have lots of friends and family coming over. And they are all impressed by the toys. They are full of detail with plenty of mini-builds (from a mini-saxophone to a rotating carousel) and techniques (chimneys, large snow-covered roofs...) When I was a kid, we had the cradle with baby Jesus surrounded by his parents in a shed with some decorative animals. Thirty years later, a whole jolly town surrounds that little barn. We add candles and the houses of the 10193 Medieval Market Village. But I'm sure you could be creative with the fairground mixer (10244) too (which reflects in the dark but might need some 'retrofitting'). And maybe the Constitution Train (79111) would work too? With some white bricks on the roof and wagons, the outcome could look splendid indeed. 5. End of Line: Get your LEGO below MSRP! I'm sure you've read it already somewhere, but just to be complete: each sets gets 2 years of seasonal shelf life. Every year you can easily find them from October until February. thereafter they can disappear quickly. This also means there are never more than two Christmas LEGO boxes on the shelves during the Winter backed by two bonus promotion sets which you can only get in a LEGO shop or on S@H during a short window of time. One great effect of the systematic (short) 2 year life cycle, is that the value increase of the LEGO Winter sets after EOL date is swift and doesn't get diluted by time. Other larger and popular themes suffer from extensions. That predictability allows you to get your investment timing perfectly right to optimize the working capital and CAGR per year. Personally, I think the case is simple. Christmas LEGO is great for building and investing. Sets are beautiful, the CAGR is great, demand is structural, and visibility high. Packing and shipping is easy with boxes just the right size. And the price points also perfect: not too low, not too high. Until now, the sets haven't been hoarded too much and I personally hope it will stay this way. 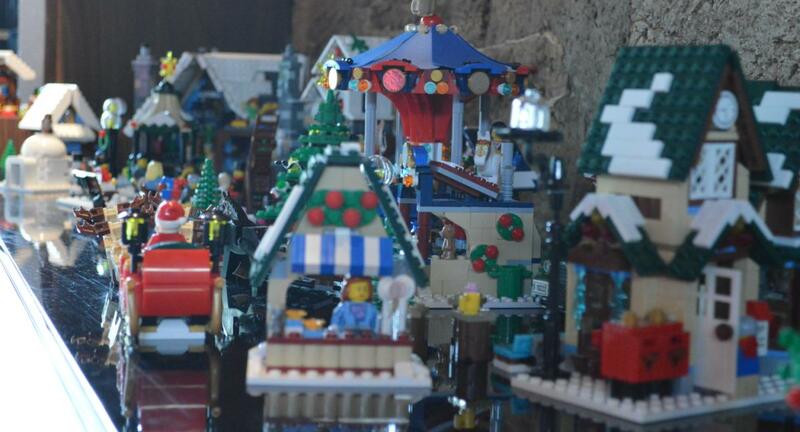 Christmas is about sharing, so I hope this article has also convinced you about the attractive investment proposition of this LEGO Winter Village series. Good luck with it in 2015! Great article. I could not agree more. The clockwork nature of the EOL date is one of the most important factors for investing in this theme. TRU won't have them in stock four years from now. Great article! We're replacing our traditional winter village scene with a Lego winter village. It's more fun to build them every year and watch your village grow. Love these sets! So if you're an investor or collector, you can't go wrong with these. I think that, if you research, you will find that most Winter Village sets since 2010 have had a life of 14 months (October to December of next year) instead of 2 years. Thanks for the feedback. To Raindog: Good remark on the shelf life. Two sets are live each winter. The most recent previous offering in conjunction with each year's newest addition. The release date of a set is October in year X. It lasts (in-season) during X+1 and goes EoL X+2 Q1. So it's less than 2 years indeed with periods during which they can disappear (e.g. Summer). This is the theory for S@H. Your B&M Shop might have more stock left nonetheless and do a sale, so generally there's more time to get the sets - close to two years (;-)) before appreciation started to kick in. That's how it goes in my region anyways. (Europe) Let's hope this cycle continues. Hope this helps. Happy Xmas. Being as we're right up to 2015, would it make more sense to buy the 2013 models or the 2014?